The book features more than 150 historical images and chronicles the history of the university, which celebrates 50 years in 2017. Images in the volume appear courtesy of the Archives at Wright State University Libraries. Mulholland will sign copies of her book Friday, March 10, at 3:40 p.m. in the Student Union Apollo Room, as part of the Public History program’s annual symposium. “I hope that those who were and still are a part of the community will be able to read the book and remember where they were when they see certain events or remember relationships they had with individuals discussed in the book,” said Mulholland. Wright State University became an independent institution in 1967 and spent the next 50 years growing into an innovative leader in affordable and accessible education. This year, the university is celebrating its first 50 years and setting the course for the next half century. A native of Cincinnati, Mulholland earned a Master of Arts in Public History in 2014, Master of Humanities in 2012, and bachelor’s degree in liberal studies in 2009, all from Wright State. She is currently a Ph.D. candidate in history at the University of Memphis. The history book evolved from Mulholland’s capstone project in the Public History program and demonstrates the value of the liberal arts. Dewey, who led the Public History program when Mulholland was a student, said that students in the graduate concentration in Public History are required to complete a capstone project for their master’s degree. “When Rebekkah and I discussed possible projects, she was interested in writing a major paper on a topic of interest to her,” Dewey said. One of the ideas that emerged was the history of Wright State University, since it would soon be 50 years old. “Public history capstone projects require that the project have lasting impact for the community, so we decided to take it one step further and see if she could get a history of WSU published,” Dewey said. Arcadia was suggested as a potential publisher. “Rebekkah contacted them, prepared the book proposal, and worked closely with university records manager, Chris Wydman, and me to see the project to conclusion,” she added. Mulholland hopes that this work will evoke invaluable memories for those who are a part of Wright State’s community past and present, as well as encourage future generations to be a part of such a unique community. She also hopes that the book will be regarded as a gift to the community as Wright State University celebrates its 50th anniversary as an independent campus in 2017. 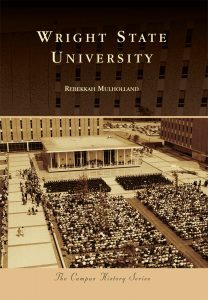 Rebekkah Mulholland, who has earned three degrees from Wright State University, has authored a book on the university’s history. “As someone who grew up as a student of the university, from undergrad through two master’s degrees, I hope that my book will be something that helps people to understand why I stayed for as long as I could,” said Mulholland. At the University of Memphis, Mulholland is the president of the Graduate Association for African American History. Through this organization, she volunteers and hosts numerous events for the greater Memphis community throughout the school year. 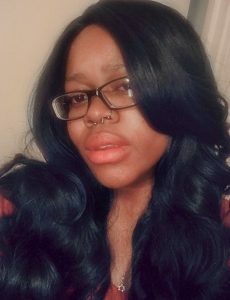 She also finds time to participate in local and national grassroots activism, improve her acoustic guitar skills, blog, and focus on her veganism and juicing. “Wright State University” is the newest addition to Arcadia Publishing’s Campus History Series. The book begins with how the university came to be. Plans to establish the first public institution of higher education in the Dayton region were laid in 1961. At the time, Dayton was the second largest metropolitan city in Ohio. The need for a public higher-education institution became critical as Dayton emerged as a center of high technology that needed an educated workforce. In 1962, many key business leaders throughout the community led a community-wide fundraising effort to secure the necessary seed money for the branch campus of Ohio State University and Miami University. In the fall of 1964, with the completion of Allyn Hall, the “campus within a building,” the Dayton campus of Ohio State University and Miami University opened its doors to 3,203 enrolled students. 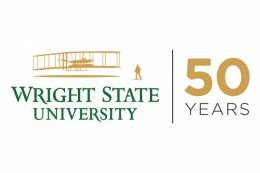 It became an independent institution in 1967 and was named Wright State University to honor Dayton natives and aviation pioneers Orville and Wilbur Wright.